Magnetic nanostructures are key to many different applications not least the storage of data on a computer hard disk. As data density requirements increase those nanostructures by turn must be made smaller. However, they could become so small that magnetic measurements are no longer possible with adequate resolution. As such, a team from Beijing, Uppsala and Jülich, writing in Nature Materials, explains how they have taken strides towards very high resolution magnetic measurements. Their method should allow scientists to measure the magnetism of individual atomic planes. The rapid advance of computing and electronic devices and the emergence of spintronics with all that promises to future generations of components, there is an increasing need for techniques that can measure precisely the physical properties of functional units that are mere nanometers in size. Indeed without high-resolution measurement capacity it might not be possible to build and test novel spintronic devices in sufficient detail for quality assurance. One technique does perhaps have the requisite capabilities - the transmission electron microscopy (TEM). TEM is a unique experimental tool offering scientists and engineers a wealth of information about a wide range of materials. As the name suggests, the TEM uses electrons instead of the photons of a conventional optical microscope. This allows much greater resolution limited by the putative wavelengths of electrons rather than the relatively large wavelengths of visible light. It is, with TEM, possible to routinely observe individual columns of atoms in a crystal, for instance. Moreover, TEM can offer information about structure, composition, and the chemistry of materials. 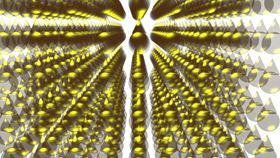 Recently, scientists demonstrated that it is possible to use TEM to measure magnetic properties too. Until now, however, achieving atomic resolution of magnetic measurements with TEM was not possible. "The idea came from Xiaoyan Zhong...we have contributed simulations, which have confirmed the validity of the experimental design and demonstrated that the experiment really offers a very detailed look at magnetism of materials," says Ján Rusz. The material in the present work is strontium iron molybdate, Sr2FeMoO6. Fundamentally, the team has demonstrated that it is possible, through a combination of electron energy-loss magnetic chiral dichroism and chromatic-aberration-corrected TEM to achieve atomic-scale imaging of magnetic circular dichroism. The researchers explain that this approach reduces the focal spread of inelastically scattered electrons by several orders of magnitude as compared to results obtained with simple spherical aberration correction alone. As such, they can obtain element-selective orbital and spin magnetic moments atomic plane by atomic plane. "Our method should provide a way to measure interface magnetism atomic plane by atomic plane," Rusz told Materials Today. He points out that, "The interface or surface properties of materials differ from properties of bulk materials and so far it has not really been possible to measure such interfaces with sufficient spatial resolution." The new work could change all that.